← What Parts Do You Need to Tow a Trailer? Learning how to drive a towing vehicle is one feat, but learning how to properly load the towed vehicle is another. And one commonly overlooked in terms of towing safety. Not only can improper towing cause serious accidents and losses, improper loading of trailers can also cause these types of damages. When it comes to towing, don’t stop at learning the basics; instead, be sure to cover all towing safety hazards and precautions, as well as, proper connecting and loading methods. 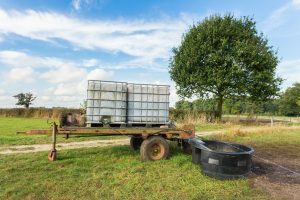 Continue reading to review some important tips about safely loading a trailer before you tow it. Loading a trailer takes some rudimentary understanding of physics, namely inertia. Inertia is the theory that objects in motion tend to stay in motion, whereas objects that are stationary tend to stay still. This idea can directly relate to the items loaded in a moving trailer or vehicle. Even if the brakes are initiated properly, trailers and their cargoes will still want to continue moving in the direction they have been. This is why it is important to position them in the trailer correctly, to avoid tipping accidents and other damages caused by imbalanced cargo. •	Read vehicle’s owners’ manual for weight capacity. •	Glue mats down to the floor of the trailer to increase friction and reduce slipping. •	Distribute and spread cargo out as evenly as possible. •	Always place heavy items on the bottom and lighter items on top. •	Keep loads as low as possible for flatbed tows. •	Use straps and ropes to tie down large cargo items. •	Do not let anything protrude from the back of the trailer. •	Use a public scale to weigh your trailer after loading it. •	Always park on level ground. •	Use cement blocks if you must unload on an incline. •	Utilize ramps and dollies to reduce exertion and back injuries. •	Move heavy items slowly. 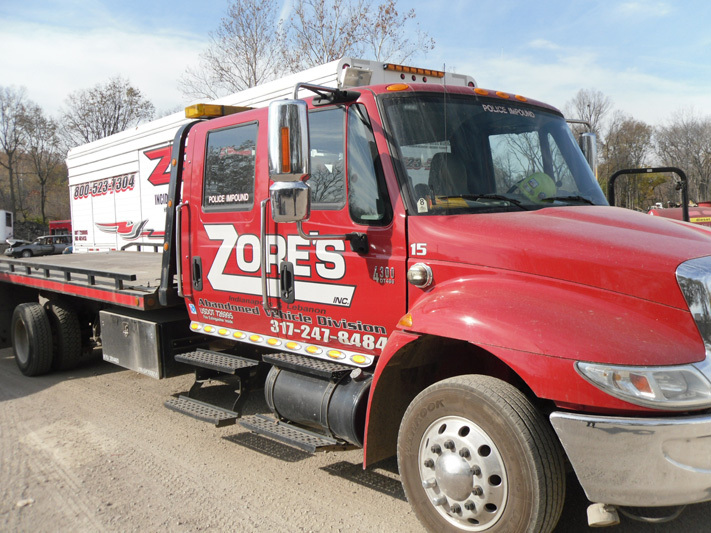 Call Zore’s Towing at 317-247-8484 for fast and friendly tow truck services in Indianapolis and its surrounding areas. 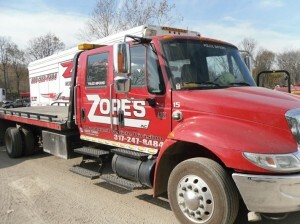 Our towing company retains an extensive fleet of towing trucks and equipment, allowing us to provide a wide range of tows for all vehicles and commodities. We offer 24 hour towing for all Indianapolis counties and neighborhoods. Call 317-247-8484 if you want reliable towing service at a reasonable price. This entry was posted in Towing and tagged 24 hour Towing, 24 hr roadside assistance, camper towing, Flat Bed Towing, Indianapolis Towing company, tow truck services Indianapolis, towing tips, trailer towing. Bookmark the permalink.